Background: Menstrual cramps is the occurrence of labor-like pain in the lower abdomen, accompanied by symptoms like nausea, vomiting, diarrhea, headache and dizziness. A natural approach towards the treatment of painful menstruation is the need of the hour to be imparted in mind/body practices to be considered for long-term relief from the pain of menstrual cramp forever. Objective: The current research is aimed at the review of the various aspects of plant alternates serving in different ways to relieve the cramps occurring in menstruation. Materials and Methods: The herbal alternates as relievers were categorized on the basis of the respective role being played by them as nutritional supplements, analgesics, anti-inflammatory and as aromatherapy agents. Results: There are various plant sources which are mild as well as effective relievers of menstrual cramps. 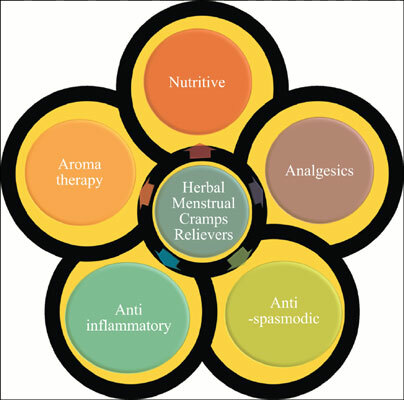 This review highlights the various plants which have been proven to be useful in dealing with the various issues of painful menstruation. They deal with all the complications and issues, arising during this time. Conclusion: These herbs are a potent source of active medicaments that strengthens the body to overcome the cramps and pain occurring in menstruation. The demand of the present hour is to rely on the beneficial effects of various herbs, which relieve these complications in the most soothing and efficacious manner. Dysmenorrhea, cramps, herbs, pain, reliever, menstruation.